Fifteen-year-old Madison “Madi” Phelps, of Robbins, Calif., has been a UC Davis Children’s Hospital patient since she was 11 months old. Diagnosed with cystic fibrosis, a genetic disease that causes persistent lung infections, she is often admitted to the hospital for maintenance treatment, two weeks at a time. Because of the nature of cystic fibrosis and her susceptibility to infection, Phelps is always in isolation. But the music therapy program at UC Davis Children’s Hospital has helped Phelps, and other children and teens who are healing from chronic diseases or injuries, strengthen their coping skills, both in the hospital and at home. 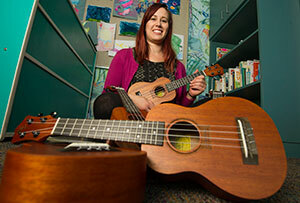 Tori Steely, UC Davis Children’s Hospital music therapist, began working with Phelps three years ago when she was an intern with the hospital’s music therapy program. Phelps had already been taking piano lessons with the children’s hospital music therapy program during her hospital admissions since she was seven. A year ago, Steely introduced Phelps to the ukulele. As part of UC Davis Children’s Hospital’s affiliation with the Ukulele Kids Club, Steely was able to give Phelps a ukulele to take home to continue practicing. Phelps is now a sophomore in high school, but she had to begin homeschooling this year. She misses being in school and seeing her friends each day. Music therapy is part of the Child Life and Creative Arts Therapy department at UC Davis Children’s Hospital. Music and art therapists promote healing by offering tools for self-expression while children cope with symptoms, stress or traumatic experiences. Steely typically gives patients different options for music therapy, from songwriting and making a song in Garage Band to learning to play the piano or ukulele. Sessions usually take place at the bedside, but there is a teen group that meets every Friday. The group alternates each week between art therapy, music therapy and child life. 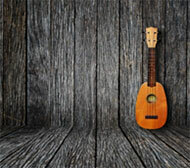 Phelps is part of a group of teenagers who began learning ukulele together. 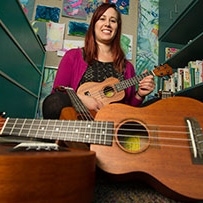 UC Davis Children’s Hospital has been a recipient of the Ukulele Kids Club’s donated ukuleles since April 2015, and was one of the first 10 hospitals in the country to participate.